The Naval Academy football team clinched its trip to the postseason in decisive fashion Saturday, rolling over South Alabama 42-14 in Annapolis to move to 6-4 on the year. The win guarantees Navy will finish its regular season at .500 or better, meaning it can accept a bid to the Bell Helicopter Armed Forces Bowl, which kicks off at 11:45 a.m. Eastern on Dec. 30 in Fort Worth, Texas. Navy’s set to face a team from the Mountain West Conference, though the Mids might not know which team until early December. Can’t swing a trip to Texas over the holidays? No problem — Navy fans can show their support by donating tickets that will go to mids or active-duty sailors and Marines who can. Purchase those tickets, or some for yourself, here. 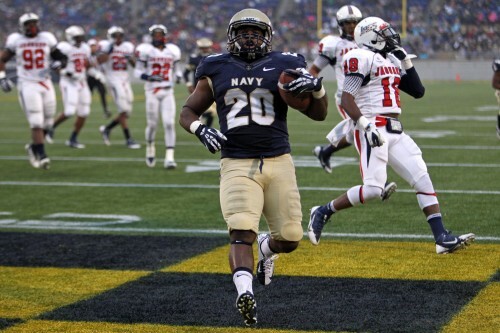 It’ll be Navy’s first trip to the Armed Forces Bowl, which is no stranger to service academies. Army beat SMU 16-14 there in 2010, and Air Force, an MWC member, has played in four of the 11 Armed Forces Bowls, including a 33-14 loss to Rice last year. Navy travels to San Jose State for a Friday night game this week, then will be off until Dec. 14, when the Mids look to extend their series-best 11-game winning streak over Army. That game will kick off at 3 p.m. Eastern in Philadelphia, which also hosted last season’s 17-13 nail-biter.